The III. 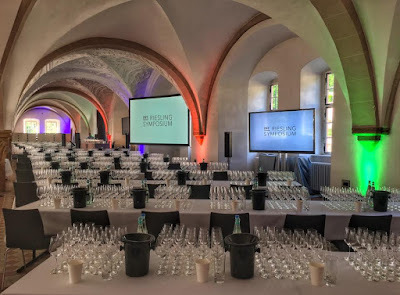 International Riesling Symposium (IRS2017) that took place on May 29 and 30, 2017 at Kloster Eberbach, Rheingau, Germany, provided the opportunity to tour 4 Rheingau Riesling Giants: Weingut Robert Weil, Schloss Johannisberg, Schloss Vollrads and Kloster Eberbach. The pre-conference tour on Sunday, May 8, 2017, went to the former three. A tour of Kloster Eberbach and its winemaking facilities was part of the regular conference program on Monday, May 29, 2017. 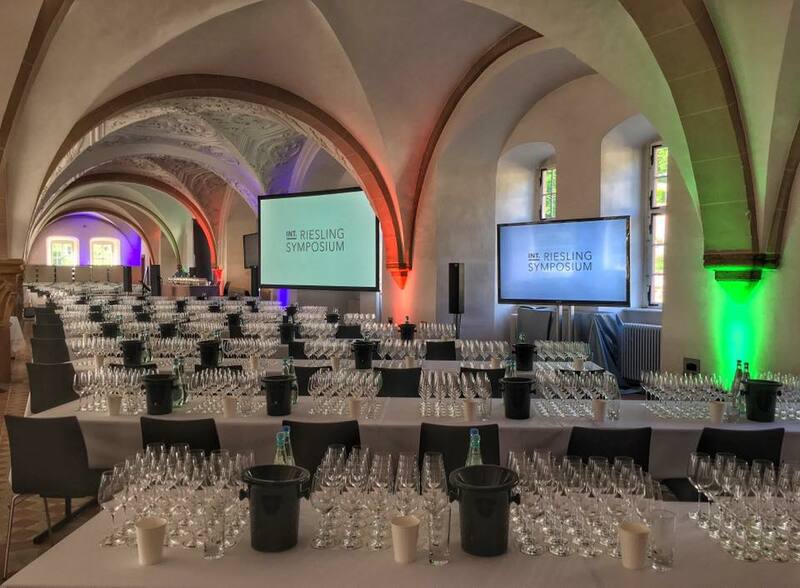 On May 29 and 30, 2017, Riesling experts from around the world - top winemakers, representatives from the trade and restaurant sector, and journalists – gathered at Kloster Eberbach in the Rheingau to celebrate, discuss and taste the arguably most noble white grape in the world - Riesling. 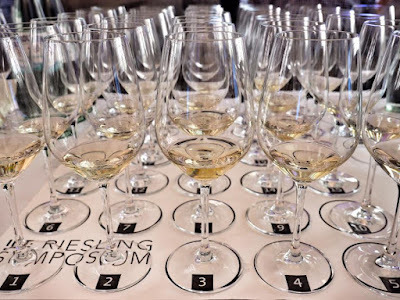 The International Riesling Symposium in the Rheingau is part of the so-called Riesling Coalition, encompassing 3 major Rieslings events in Germany (International Riesling Symposium), in the US (Riesling Rendezvous) and in Australia (Riesling Downunder). 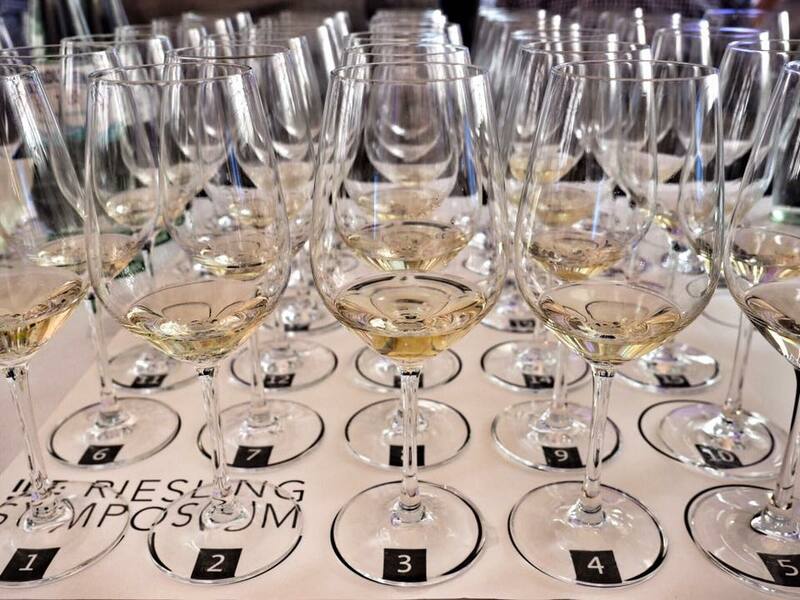 Following this year’s International Riesling Symposium in the Rheingau, the Riesling Coalition caravan will travel to Australia next year for the 2018 Riesling Downunder, followed by the Riesling Rendezvous in Seattle, Washington State, in 2019 and the next International Riesling Symposium in the Rheingau in 2020. 4 very interesting lectures, 4 outstanding wine tastings - one in the morning and one in the afternoon of each day - a tour of the Eberbach Monestary, where the conference took place, plus the Staatsweingüter Kloster Eberbach and a walking wine dinner provided for two fascinating and highly entertaining days around Riesling. 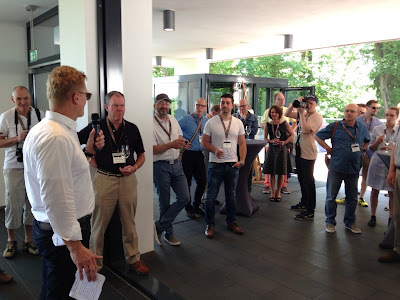 Additionally, participants had a chance to visit Weingut Robert Weil, Schloss Johannisberg and Schloss Vollrads on a pre-conference tour on Sunday, before the conference started. The symposium was attended by about 250 people, including such luminaries as Stuart Pigott from Germany, Willi Bründlmayer from Austria, Helmut Dönnhoff from the Nahe, Ernst Loosen from the Mosel, Anne Trimbach from Domaine Trimbach in Alsace, Jeffrey Grosset of Grosset Wines in Australia and Andrew Hedley of Framingham Wines in New Zealand. The conference was organized by the VDP Rheingau and Weingut Weil. The VDP is Germany’s elite winemakers association; it has about 200 members. Top winemaker Wilhelm Weil and his Deputy Director Jochen Becker-Köhn orchestrated the event. Although the Rheingau is one of Germany’s smaller wine-growing regions, its 3,100 ha (7,660 acres) of vineyards are vastly diverse in their geological makeup. The soil varies from stony slate at the western part near the villages of Assmannshausen and Rüdesheim to loess, sand and marl in the lower central villages of Geisenheim, Johannisberg, Winkel, Oestrich and Hattenheim. Soil reverts to stony phyllite in the higher central and eastern villages of Hallgarten, Kiedrich and Hochheim. Generally, wines from the lower slopes where the soil is heavier—sandy loam and loess—produce fuller wines, while at the higher slopes where it is more stony and slatey, the wines reflect more minerality, elegance and concentration. The IRS2017 Pre-conference tour on Sunday, May 28, 2017 started at Weingut Robert Weil. We met there at noon for lunch, tasting and cellar tour. From Weingut Robert Weil in Kiedrich we drove by bus to Schloss Johannisberg. There, we were received by the new Managing Director of Schloss Johannisberg, Stefan Doktor. We toured the historic cellar of Schloss Johannisberg and walked around the castle through the vineyard. Wine making in the Schloss Johannisberg vineyards started long before the castle was build, during the reign of Charlemagne. The hill became known as Johannisberg (John's mountain) in the 1100s, when a Romanesque basilica in honor of John the Baptist was built on the hill. The Chateau that we see today was built in the 1700s by the Prince-Abbot of Fulda. In 1720 he planted Riesling vines, making it the oldest Riesling vineyard in the world. For many centuries the estate was owned by the Prince-Abbot of Fulda, but changed hands several times during the Napoleonic wars and subsequent secularization. In 1816, Austrian Emperor Francis II, gave the estate to his Foreign Minister, Prince von Metternich, as a thank you for his successful negotiations in the reorganization of Europe during the “Congress of Vienna”. The last resident of the Metternich family at Schloss Johannisberg, Tatjana Princess von Metternich was a patron of the arts in the Rheingau and beyond and revived the castle to its former glory after the destructions during World War II. After her death in 2006, the Oetker family (yes, that's the one that produces baking helpers and puddings) bought the estate. The vineyard Schloss Johannisberg is also a single vineyard designation (Einzellage) in its own right. Like the Steinberg, it is one of a handful historic German vineyards which do not have to display a village name on the label. Thus, the vineyard designation on the label is Schloß Johannisberger. There are currently about 35 hectares of vineyard. The Oetker family also owns the renowned Weingut G.H. von Mumm, also in Johannisberg. Weingut G.H. von Mumm is jointly managed with Weingut Schloss Johannisberg by Christian Witte and his team. Long before printed labels were common practice, Schloss Johannisberg had its own system of distinguishing among its bottlings through the use of colored seals. Introduced by Fürst von Metternich in 1820 and in use to this day, the quality of a wine can be identified according to color. From Schloss Johannisberg we walked through the vineyards over to Schloss Vollrads. It took us about 30 minutes. At Schloss Vollrads, Managing Director Rowald Hepp and Deputy Managing Director Christine Müller were our hosts. They showed us around at Schloss Vollrads, including in areas that are only opened to the public at special occasions, 2 or 3 times per year. Following the tour, we had dinner at Schloss Vollrads. Schloss Vollrads is a historical monument and one of the art-historical highlights of the Rheingau region. It is also one of the oldest wine estates in the world; wine sales have been documented as early as 1211. The impressive tower house, built in 1330, was constructed on the foundation of a roman defense tower. Schloss Vollrads was owned since 983 until 1218 by the Archbishop of Mainz and since then until 1997 by the family of Greiffenclau. In 1997 – in view of unsurmountable debts - Count Erwein Matuschka-Greiffenclau committed suicide and since then the Nassauische Bank, a government-owned bank, is the owner of Schloss Vollrads. Schloss Vollrads is a rather large estate by German standards, with 60 hectares of vineyard land, and produces exclusively Riesling wines. Some of the vineyards were already in the possession of the Greiffenclau family in 1300. Today, Rowald Hepp is the Managing Director of Schloss Vollrads and Christine Müller his Deputy. Rowald Hepp: We believe that an outstanding Riesling makes you happy. That’s why we only grow Riesling grapes – deliberately, with special care, and with love. We cherish our vines. We pick our grapes very carefully by hand – and that several times per season – in order to collect them at precisely the right degree of ripeness. We make use of our knowledge and a tradition of over 800 years of viticulture, so that our grapes can become the very special Riesling that will make you happy. On some 80 hectares of vineyards we make unique and authentic wines. Nature is on our side as all vineyards around Schloss Vollrads descend down to the Rhine in a southerly direction. Our capital does not only rest in vines and soil alone: Particularly valuable are our staff with their years of experience, because a vineyard is like a living being and wants to be treated accordingly. Schloss Vollrads and its staff will do everything they can to make wine an experience for you. Here, art, culture, cuisine and wine cellar complement each other. Please visit us and find out more. The distinctive flavour of the Schloss Vollrads Riesling wines can be attributed to our unique terroir: In the Rheingau, six different geological formations form layers of one structure which provides the vine roots with a variety of minerals. We make ten to fifteen different wines from our Riesling grapes per year, from estate wines to Kabinett and Edition to Spätlese (late harvest) and Auslese (special selection). If the conditions are right, we also produce wines of special quality such as Trockenbeerenauslese (dry berry selection) or ice wine. Even in our simple estate wines we wish to demonstrate class and offer a quality wine which will succeed in making those love wine who hitherto have only drunk wine occasionally. Incidentally, the tradition of the Kabinett wines was established at Schloss Vollrads in 1716: Particularly good wines of a vintage were stored in the “Cabinet” cellars. Even today, internationally renowned Riesling wines mature to completion in the winery. A tour of Kloster Eberbach and its winemaking facilities was part of the regular conference program in the afternoon on Monday, May 29, 2017. My group started the visit with a tour of Kloster Eberbach. From there, a bus took us to the near-by new winery and the famous Steinberg vineyard. The Eberbach Abbey is a former Cistercian monastery, founded in 1136 by Bernard of Clairvaux as the first Cistercian monastery on the eastern bank of the Rhine river. Today, the Eberbach Abbey is a large State-owned winery (the State of Hessen is its proprietor) and one of the largest wineries in Germany. Its Romanesque and Gothic buildings are impressive. Most of the vineyard holdings of the Hessische Staatsweingüter Kloster Eberbach date back to the 12th centuries, when Cistercian monks founded the Eberbach Abbey. The vineyards of Eberbach Abbey were, at 300 hectares, the largest in medieval Europe. The Hattenheim Estate (50 hectares vineyard area in the Engelmannsberg, Siegelsberg and Marcobrunn sites).